Reminder: Our Northern Meetups Are Next Week. Is Your Pitch Ready? UPDATE: Free T-Shirts! Hello, Great White North! We are officially out of tickets for the Northern Meet-ups, our flights and hotels are booked, and we’re raring to meet all of you in Toronto, Detroit, and Chicago. For more information head over to the individual event pages (Detroit, Chicago, and Toronto); if you’ve signed up be sure to show up early because we’re expecting a packed house at each one. To recap, we’re holding the events at Toronto’s Steam Whistle, Detroit’s Hockey Town Cafe, and Chicago’s Zhou B Art Center, and more TechCrunchers than ever before will be in attendance. Here’s the whole roster: Jordan Crook, John Biggs, Matt Burns, Colleen Taylor, and Darrell Etherington, Romain Dillet and Elin Blesener. 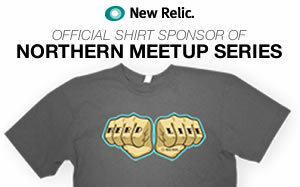 The fine folks at New Relic have agreed to give every attendee of our Northern Meetup Series a free Nerd Life t-shirt at the door. So cool! Not going? For the next few days, you can get one for free too, just by following this link and enter the promocode TCTEE on signup (feel free to share the code) and when you start monitoring your web app using their FREE monitoring service, they’ll send one to you – no strings attached. They are on a mission to fuel the nerd economy – be part of the nerd movement! Ford is loaning us some cars to ride around the lonesome north.